The importance of using products and methods that minimise adverse impacts on health and the environment grows stronger every day. More and more companies worldwide are basing their decisions on life cycle information, in effort to gain the most from their actions without unintentionally jeopardising their ability to thrive in the future. Twister™ is a revolutionary daily floor cleaning system consisting of a floor pad prepared with billions of microscopic diamonds which cleans and polishes the floor mechanically instead of using chemicals. Twister™ cleans, polishes and preserves the floor brilliance – without time consuming effort, and without polish, wax or other chemicals. The combination of a soft floor pad and the hardness and sharpness of a diamond creates a unique product that follows the structure of the floor surface and effectively removes dirt at the same time. This creates the possibility of chemical free daily cleaning with high gloss every day. Twister™ is the ecologically friendly janitorial system that leaves a cleaned surface but at the same time polished surface without any requirement for chemicals or special competence. This creates a whole new standard and demand within the contract cleaning industry as well as for buyers of cleaning services. By treating the dirt mechanically (by polishing and maintaining the floor with diamond impregnated pads) you reach an exceptional cleanness and high shine without using detergents or polish. Furthermore the method does not wear out your floor. Twister™ is the tool that transforms your dull, worn floors into clean, glossy and brightly polished floors. Twister™ brings out the qualities of all of the most common floors including terrazzo, marble, natural stone, concrete, vinyl and epoxy. The diamond prepared pads fit all types of auto scrubbers and polishing machines, replacing all other cleaning methods and streamlining the daily maintenance. Compared to traditional ways of floor cleaning containing cleaning detergents, polishes, waxes and chemicals for periodic floor maintenance, Twister™ is used without chemicals and with eliminated need for periodic floor maintenance. This means a huge environmental benefit for everyone. Twister™ leaves a surface that is cleaned and at the same time polished without any requirement for chemicals or special competence. This creates a whole new standard and demand within the contract cleaning industry as well as for buyers of cleaning services. With Twister™, the same cleaning routines and machinery as before is used. Just change the traditional pads and chemicals to a Twister™ pads and water. Compared to traditional chemical based cleaning, where the chemicals is given a very short time to react with the dirt when using auto scrubbers, the Twister™ pad will effectively remove any dirt or grease mechanically during normal cleaning routines with the help of diamonds. No extra time or effort is needed. With Twister™ you reach dirt deep down in scratches and joints which are normally hard to reach; the result is as good on plastic floors as on stone floors. The fact that a cleaning method that eliminates the use of chemicals gives a better result than the conventional cleaning methods is a revolutionary detection that echoes in the whole world. When compared to traditional daily floor maintenance methods, Twister™ has been proven to clean the floor surface as effectively, or even slightly better. 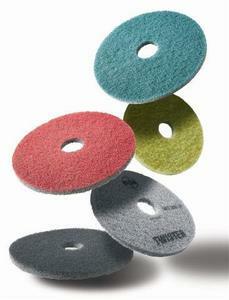 Twister™ can be used on all of the most common floor surfaces like terrazzo, natural stone, concrete, vinyl and epoxy. By using Twister™ for daily maintenance the floor will stay shiny and clean without any need of periodical maintenance. This along with the fact that you can use the pads on existing equipment and that the pad lifetime is long, makes the method both cost efficient and time saving. The pads have different colours depending on the size of the diamonds. For daily maintenance you use the green pad – nothing else is needed. However you can upgrade an old, worn floor by using a coarser pad. The floor becomes like new and the floor life increases dramatically. There are numerous types of floor maintenance pads on the market which can be used together with many different types of floor cleaning chemicals. The choice of pad and chemical depends on the type of floor and the purpose of use (cleaning or polishing). With Twister™, these often complicated choices are history! 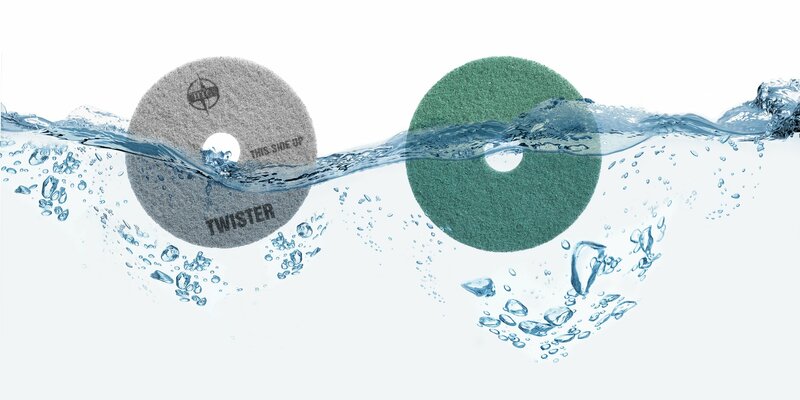 The only thing used together with the Twister™ pad is water to bind and transport the dirt from the floor to the suction system. The green Twister™ pad is also ideal for dry high speed polishing of the floors and can be used up to 3500 rpm (UHS). 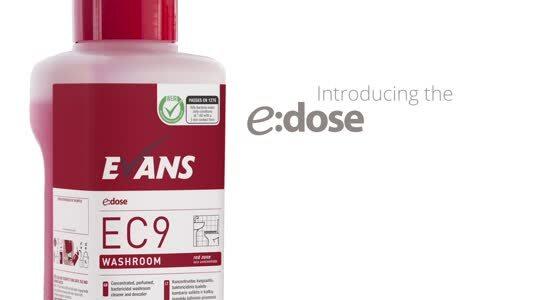 The DCS Hybrid™ system gives new life to damaged and heavily worn natural stone and terrazzo floors. Easy to use and environmentally friendly, the DCS Hybrid™ gives you the opportunity to remove stains, scratches and "orange peel” using only ordinary cleaning machines and water. Refurbish your floor instead of replacing it! HTC Sweden AB is a Swedish company based in Söderköping, Sweden with subsidiaries in Germany, France, England, the USA and distributors all over the world. HTC TWISTER™ – JUST ADD WATER!